Knowing each would-be ancestral cuisine educator will have their own unique goals for the future, we’ve designed a two-track course of study enabling students to tailor the program to their individual needs. Comprised of three modules, this track concentrates on preparing students to enter the world of Ancestral Cuisine Education. Track one requires nine months to complete, and is designed to allow students the flexibility necessary to participate as best serves their personal schedule. Each week’s assignments include both self guided and “live” activities related to the subject matter being explored that week. Module One: Foundation— This twelve week module is dedicated to furthering student's exploration of material relevant to that studied in the Lardmouth Level I Ancestral Cuisine Series, deepening student's knowledge base via in-depth, independent and group study of three key resources: The Vegetarian Myth by Lierre Keith, Deep Nutrition by Dr. Catherine Shanahan, and Put Your Heart in Your Mouth by Dr. Natasha Campbell McBride. Each of the three, four-week sections will include; a video lecture, online study guide material & assignments, a live, online group discussion, and a group-reviewed video assignment submitted by each student. Upon completion of this module, students will feel confident and ready to speak comfortably about the “six principles” of Ancestral Cuisine. Module Two: Application— This twelve week module will revolve around advanced kitchen skill-building; recipe compilation/blogging practice and video/in-person kitchen demonstration. 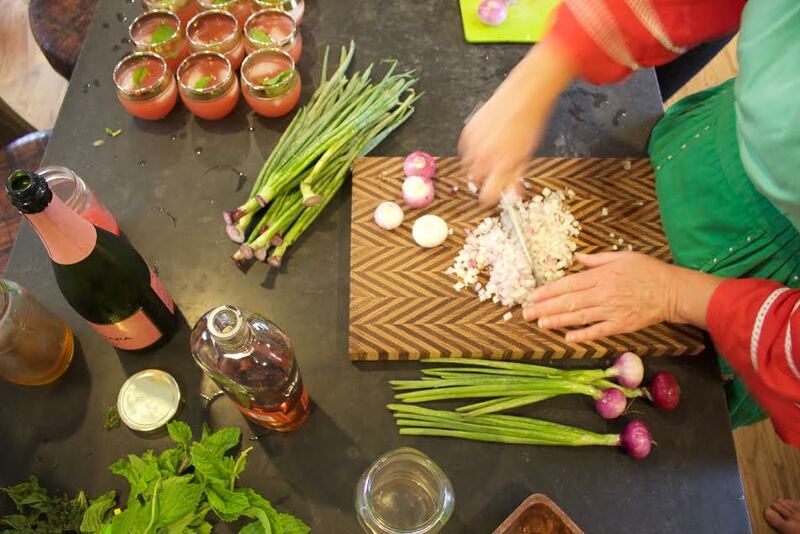 Weekly hands-on assignments will provide students an opportunity to expand their real food kitchen repertoire in each of the six principle categories, while simultaneously creating their own ancestral cuisine recipe, blog and video portfolio. Student cookbooks will be ultimately be compiled in an online recipe data base made available to all graduates of the program, which will serve as an educational resource for new teachers as they launch their programs. Completion of this module will require attendance at the onsite weekend training intensive to be held in San Diego. Module Three: Mastery— This twelve week module is the culmination of the Certified Educator Program, and will find students organizing, promoting and facilitating their very own six week Level I Ancestral Cuisine Series. The first six weeks of Module Three will be a guided, step by step exercise in creating an educational opportunity in each student's own community, with lots of hand-holding from the Lardmouth staff, which will ultimately result in student-teachers executing their first solo series during the final six weeks of the module/program. Graduation from this program will require compilation and submission of a 'student assessment and review package' from teacher trainees, at which point they will be awarded a certificate of completion and conferred Certified Lardmouth Ancestral Cuisine Educator status. Graduates will be entitled to all benefits of association with the Lardmouth Ancestral Cuisine Academy including inclusion in the Lardmouth.com International Educator Database. Tuition for the Lardmouth Certified Ancestral Cuisine Educator program is set at $2700. Although a full-program commitment is required, tuition payments of $950 per module may be arranged on an individual-needs basis. This optional and adjunct track consists of three additional months study, serves as Module Four, and is designed to train Certified Educators in a specific kitchen-centered healing protocol demonstrated efficacious in assisting clients with the application of deep-nutrition for specific healing objectives. Module Four: Expansion— If we embrace the Hippocratic tenant “All disease begins in the gut” never before has it been more imperative to restore optimal digestive function. It seems almost weekly science is bearing out what our wise ancestors knew about the power of deep nourishment to impact all areas of health and wellness. The “gut-brain” connection, the “gut-immunity” connection, in fact, as the research continues to demonstrate, there truly is no aspect of human biological function not driven by our “second brain.” Clearly, what we introduce into this highly evolved system in the way of food, will to a very large degree determine its function. Which brings us to our second Hippocratic tenant “Let food be thy medicine.” This module will root students in the fundamentals of the GAPS Dietary Protocol created by Dr. Natasha Campbell McBride, with specific emphasis on facilitating successful and long term execution of the protocol. By the end of this course, students will be well-versed in providing clients with one-on-one instruction, in-home assistance, ongoing support and long-term follow-up in healing the gut microbiome. Each participant in the program will be called upon to demonstrate facility with GAPS by way of personally and actively employing the protocol for the entire twelve weeks of the module, as well as submitting a weekly journal of their diet and protocol specifics to the Lardmouth Academy staff for review. Certification will require completion of the reading/video viewing list, attendance at weekly online group discussions, as well as submission of a written essay and video presentation. Successful completion of this module will provide clients with the tools necessary to empower their students in claiming their divinely bestowed birthright of Natural Fertility, Heightened Immunity and Functional Longevity! Tuition for the Lardmouth Certified Ancestral Cuisine Healer program is $900, and due in full at the time of enrollment. Enrollment in both programs will entitle students to a $300 full-program tuition discount, available only to students who remit the entire tuition at the time of enrollment. Prerequisites for Track One are completion of the Lardmouth Level I & II Ancestral Cuisine Series for those in the San Diego/Orange County/Los Angeles areas, and completion of the Lardmouth Online Level I Ancestral Cuisine Series for those further afield. Prerequisites for Track Two are completion of the Ancestral Educator Track One. Reliable internet is a must for successful participation in the online, interactive video portions of both programs, so applicants must be willing and able to secure/demonstrate such access before gaining acceptance to either program. Some technical skill are required for video-making, but we are confident we can assist you should you feel the need - don’t let that hesitation stop you! Enrollment will be secured in the order of application, and space in both programs is limited. Once the maximum number of students have been accepted/enrolled, all others will be considered for the next session. Please contact us if you have any questions. If you feel you are called to participate in either or both of these teacher-training programs, please click here and register!